In French, 'frite' is used to denote the process of deep frying a food, but in America when we say 'fried' it can mean anything from pan frying to sautéing or even full out deep frying. So by adding the word French before our fry it denotes what type of fried potato product we're actually talking about. Skinny and deep fried vs. fat and pan fried. This explanation lines up with other etymologies which state that frite denotes deep frying, so French fried is "deep fried." 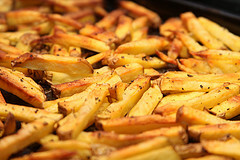 Other products than potatoes, however, were referred to as French fried—onions, chicken, etc. Notwithstanding, the etymology of the fried potato could be a little more complicated than this. As readers pointed out in the comments section on The Kitchn, the French fry moniker may actually stem from American soldiers stationed in Belgium during World War I. According to the story, soldiers, upon tasting (and falling in love with) Belgian fries (first cooked in 1680), called them "French" due to the language spoken by the Belgian Army at the time. Mistaking the Belgians for French, the fried potato product was imported to America as the French fry. Another complication in the etymology comes from the third President of the United States, Thomas Jefferson. In a manuscript dated circa 1801-1809, Jefferson writes about "Pommes de terre frites à cru, en petites tranches" ("Potatoes deep-fried while raw, in small cuttings"), a recipe attributed to his French chef. Given the Frenchness of the chef, Honoré Julien, the fried potato might have then been credited to the French. Exactly how and when the French fry came to be imported to the United States is up for debate, but it's certain that it existed from the early 19th century on. Belgium and Spain still battle over who created it first, with Spain claiming that its patatas fritas remain the original because Spain was the first New World country to import the potato. Belgium, of course, still holds strong to the idea that it was the genius behind the popular fried starch. No matter what, though, French fries are most likely not French at all—meaning that the whole freedom fry debacle of 2003-2006 might have been an unnecessary, albeit entertaining, faux pas.